​559-244-1013﻿. We'll set up a time to meet for your in-home consultation. Our consultations are always free. During your free in-home consultation, I will share with you our digital portfolio. You'll discover which granites (or other stones) you like best, and we'll discuss quality issues. By the time I leave, you'll have your cost estimate. I won't just send you to the slab yard... I'll personally meet you there. Most granite installers will leave you on your own to pick slabs, but I’ll be there with you to go over your slabs with a fine-toothed comb. I'll make sure there are no issues with your slabs that would make them unworkable for your project. With other installers, you’ll notice these flaws when they show up on your countertops. Next, we'll come template your countertops. We remove your old countertops at that time, if you've chosen that option. ﻿Our professional installation team returns to your home to complete your countertop transformation! If you've selected granite backsplashes, we'll install those within a week. If you've selected tile backsplashes, I will have referred you to a trusted and qualified tile contractor. Granite installers in California are not licensed to do plumbing or electrical work. If need be, I'll provide you with a referral list of trusted professionals who will take care of anything you need. Your granite will be a joy to live with. 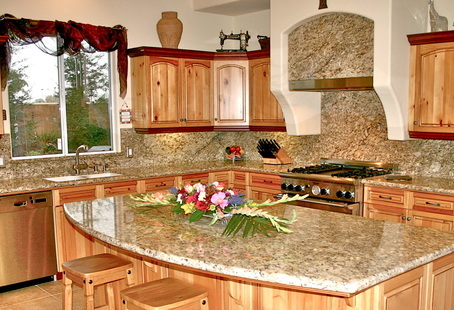 Granite is so easy to care for and its beauty is everlasting.